Buffalo wings are pretty amazing, but for me Wings and Things garlic buffalo wings are my favorite. They have a bit of spice, and a nice garlic flavor kicks in, and suddenly you are grabbing for the next wing. For me hot wings are one of the most satisfying chicken dishes you can order out. Thank goodness these were created by the Anchor Bar many years ago. For me, I like to use Frank’s Red Hot Sauce, as I think it gives just the right amount of heat. This recipe really makes a very mild buffalo wing sauce. If you like your wings hotter, you can add additional cayenne, or even a little bit of freshly chopped habanero. For this recipe we are going to quickly dredge them in a seasoned flour, and then we are going to partially fry them before finishing the cooking in the oven. I always get asked what type of oil should I fry the wings in. I really like to fry my wings in either peanut oil, cottonseed, or even canola oil. I like all three equally as well. You can even fry the wings in vegetable shortening if you like. I am having you start these in on the stove by frying them and then we are finishing the cooking in the oven. I think this will help ensure that the wings are fully cooked, but yet you get that wonderful flavor that comes from frying the wings. If you are new to cooking, I find that doing the wings this way, ensures your friends, family, and loved ones will still continue to be in those rolls. When I started cooking I sometimes undercooked chicken. Rare beef is wonderful, rare chicken is not. When it comes to buying the wings, I always like to buy whole chicken wings and then cut them myself. It is very easy to cut your own wings. Two quick cuts, and you will have your wings separated in no time. I should also mention it is often cheaper for you to go ahead and cut up your own wings for your buffalo hot wings. Sometimes people separate them into two or three pieces. Hooters cuts them into two pieces, the drummette, and then the flapper. Most other places do three cuts, the drummette, the wing tip, and then the middle portion. Very few people enjoy the wing tip of the wings. So I typically cut them into three portions, and you can make stock out of the wing tip. Wings and Things Garlic Buffalo Wings have some spice and lots of garlic flavor. Blend together flour, seasoned salt, cayenne pepper and ground black pepper. Cut wings and dredge them in the flour. Heat oil to 350 degrees. Fry wings for about 5 to 7 minutes, and then drain on a wire rack. Depending upon the side of your pot fry 5 or 6 wings at a time. Be sure to stir the wings once during cooking to make sure that the wings cook evening. Cook the wings until they just begin to brown. Bake wings for about 15 minutes or until the chicken is cooked through. Prepare the sauce by heating together in a small pot, the Franks Red Hot Sauce, butter, white vinegar, and Worcestershire sauce, garlic powder, and cayenne pepper. Whisk the sauce together when the butter has melted. Pour wings into a large bowl, and drizzle the sauce over. Turn the wings over in the sauce until they are fully coated. Serve immediately with celery stalks and plenty of blue cheese dressing. I am not that familiar with that product, I think you would just substitute out the butter and the hot sauce for the buffalo sauce. It will, you will need to fry the wings for about 12 to 15 minutes. Looks great Stephanie! I’ve never tried to fry wings and then bake them. Very cool. Thanks for sharing! I haven’t tried their wings. I bet you will like these. I love the flavor of “Buffalo Wings”, but the heat is a bit much for me. What adjustments would you recommend to bring this down to a medium range? Donna, you could cut out the Cayenne, also you may want to keep the amount of butter the same, and then add less hot sauce. I hope this helps. Thanks, I’ll try that, and let you know how it goes. You can never have too many wings! Great recipe, Stephanie! Thanks Ashley, you are right you can never have too many wings. Garlic makes everything even better! 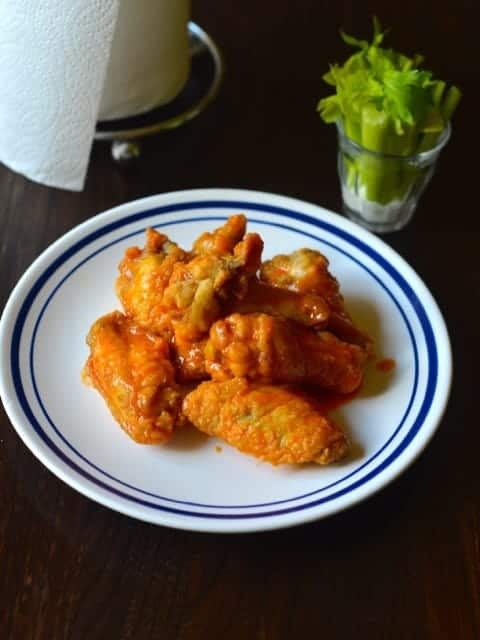 I love buffalo wings in every which way – these look delicious! So true, Garlic goes well in so many things. Thank you for your comment. What’s your favorite flavor of wings? These look perfect for an appetizer! Will definitely be making these! Thanks! These would make a great appetizer.